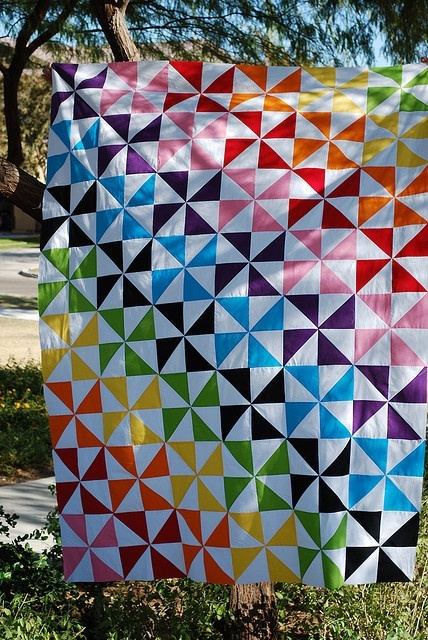 To make this quilt, she needed 1 yard of each color and 5.5 yards of white. After washing, I cut all of the fabric into 10.5″ strips, and then into 10.5″squares. 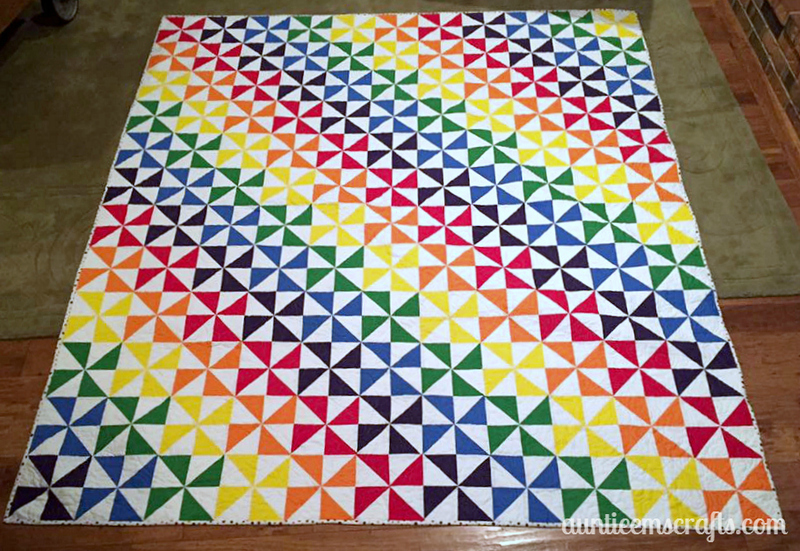 ( I cut hers at 10.5″ to give her some wiggle room, but 10″ squares is the norm for making 4″ finished half square triangles). We used 4″ Triangles on a Roll to make 8 half square triangles at a time. 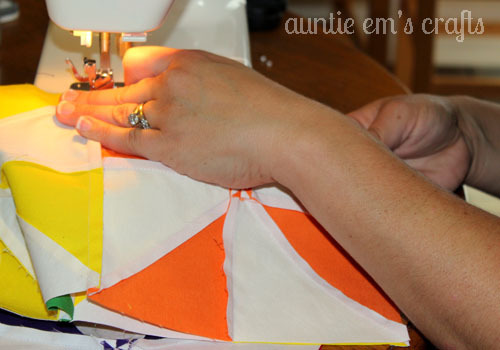 The blocks were squared up to 8″ after being sewn into pinwheels. I showed Tiffany how to perform each step along the way but had her do most of the sewing. We laid blocks out on the floor and began sewing them together in a 4 patch fashion. I prefer this method over sewing whole rows of blocks together. Unfortunately, we were only able to get about 20% of the blocks sewn together before we had to call it a day. I really look forward to seeing the finished product in person. 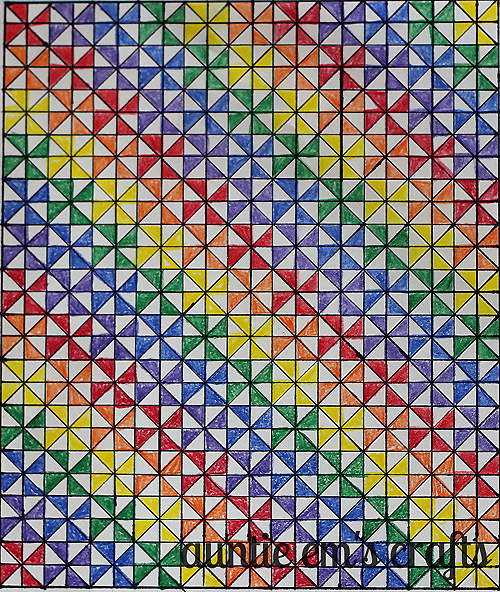 Tiffany’s quilt is laid out in an 11×13 block setting. It should measure 82.5″ wide and 97.5″ long when complete. It will be perfect for her daughter’s full size bed. You can easily make this quilt in another size. Take a look at my Quilt Size Charts to find out the min and max sizes for your project. Multiply 7.5″ (the size of the finished blocks) by a number of rows/columns to see if it fits in the min/max range. 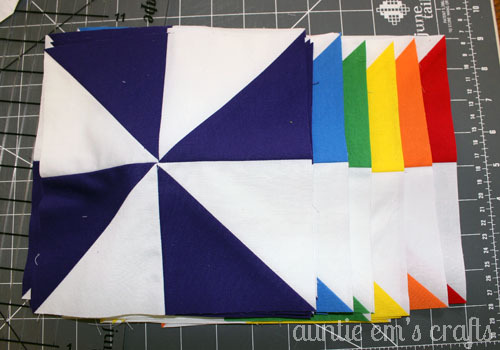 For example, a stroller quilt could be a 4×5 block setting to yield a 30″x37.5″ quilt. This is the beautiful inspiration quilt, which was made by Blueberrymoon. 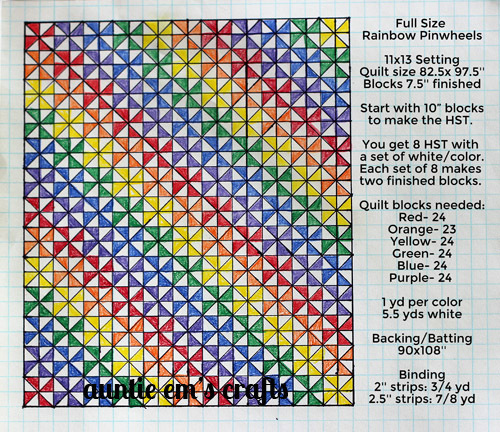 I redrew the quilt on graph paper to better show what Tiffany’s quilt will look like. You can download this project photo by clicking here. Here is her finished quilt, just one row shy of the drawing. Helping Tiffany with her daughter’s quilt really got my gears turning about making a rainbow baby quilt in the near future. 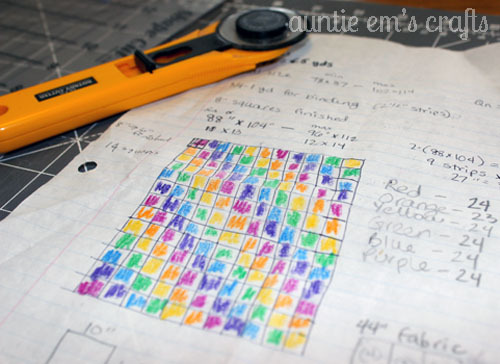 I created a Rainbow Quilts board on Pinterest to help me keep track of some good ideas. If you see pretty ones, feel free to send the pin my way to help me make up my mind! Thank you for posting this. It was a huge help. My daughter needs a larger quilt since she grew out of baby sized and this is perfect. I cam easily follow your directions and your pics are so good my little girl is excited! Wow, this is so gorgeous, bright and cheerful, but interesting with the rainbow effect. This something I would love to try. What a happy quilt! Love the rainbow look, too. I just might give this a try. Thanks for the pattern.